Dr. Sue Hong grew up in Green Bay, Wisconsin and graduated from Washington University in St. Louis where she completed both a bachelor’s and a Master of Science degree in biology. Dr. Hong then moved to the East Coast to attend dental school at Columbia University in New York City, where she was named the Percy T. Phillips Student Scholar. She also received an award from the American Student Dental Association for excellence in leadership. Following dental school, Dr. Hong moved to Philadelphia, PA with her husband who was beginning his residency in neurology at the University of Pennsylvania. There, she completed a one-year post-doctoral residency in general dentistry at the University of Pennsylvania School of Dental Medicine before returning to New York for her orthodontic residency at New York University. 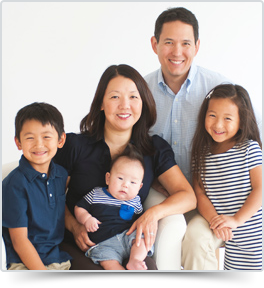 Dr. Hong had been in a full-time private orthodontic practice in the Philadelphia area from 2005 until 2009, when she decided to move back to St. Louis and open her own practice in Hazelwood. She is a Diplomate of the American Board of Orthodontics. Dr. Hong is married to Gregory Wu, MD, PhD, an assistant professor of neurology at Washington University School of Medicine. They are the proud parents of Eliot, Madeline, and Ian.